Five artists will immerse themselves in the playground of heavy industry in the UK and internationally to produce brand new work for the third installment of The National Festival of Making’s Art In Manufacturing series. Paired with manufacturing firms diverse in their scale, culture and specialisms, the outcomes of each artist residency will be premiered at the festival, taking place over Sat 15 – Sun 16 June 2019 in Blackburn, Lancashire. The groundbreaking series, co-commissioned by The National Festival of Making and Super Slow Way, has seen exhibitions, installations and performances grab festival goers’ attention annually since the inaugural event in 2017. Sculpture co-created using industrial expertise and techniques, a contemporary dance performance inspired and performed by factory bakers and a 4-dimensional soundscape capturing the oral histories of workforces presented in a long-abandoned ballroom have featured as highlights of the series to date. Exchanging their studios for the factory floor, artists have enthusiastically pushed boundaries, exploring themes of a fourth industrial revolution in installation form and re-purposing industrial machinery to become public art. Setting herself at the heart of communities, whether long-established or those that coalesce fleetingly around organisations and institutions, artist Amy Pennington makes people the core part of her practice. Often using such mediums as performance, drawing, film, events and conversations, she works with accessible materials such as cardboard to bridge high and low art, while also having turned walls, shops and arcade machines into socially-engaged artworks. Collaborating with Pennington. Heritage Envelopes in Blackburn join the Art In Manufacturing series for the first time. 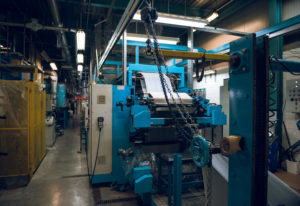 Producing 50 million envelopes a week from their Blackburn factory, the UK production facility is part of a global brand operating across 50 sites in 23 countries. Specialists in printed envelopes for business as well as retail stock for high street stores and people’s personal letters, the company is an undetectable presence in many households every day and offers rich vein of inspiration to their artist collaborator. A graduate of the Chelsea College of Art and Design, London-based Dan Edwards has worked at the heart of the British art world as a renowned picture framer, a career which has fed into his own practice with a naturally developing interest in the preservation, presentation and perception of contemporary artworks. Edwards returned to exhibiting in the North West with his first solo exhibition, titled ‘is this enough?’ at Blackburn’s PRISM gallery in late 2018. Edwards is set to enthusiastically embrace a residency with The Senator Group, a design-led furniture manufacturer established in 1976 by present day chairman Colin Mustoe MBE to create places to meet, dine and work with a difference. Outside marquee showroom in Clerkenwell, London and sites in Chicago, New York and Madrid the group’s principle manufacturing site is in Accrington, where £10 million has been invested in its state-of-the-art desk factory alone, from which over 300,000 desks, tables, storage systems and screens are exported every year. The possibilities of textiles have been the career preoccupation of the artist, Anna Ray, working with cloth, fibre and thread to realise eye-popping gallery installations at the same time as working in fine detail on delicately sewn ‘drawings’. Straddling craft and conceptual art without being defined by either category, Ray has developed and shown work with organisations including the Turner Contemporary in Margate and the RHS Chelsea Flower Show, each time drawing from her subconscious the textures and structures that she has observed around her to develop new forms. International flooring manufacturers, Forbo Flooring Systems, produces commercial flooring in materials including linoleum, vinyl and carpet tiles for a wide-range of organisations worldwide as well as a range of advanced home flooring products. The carpet tiles are produced across two sites in Lancashire. Dedicated to progressive manufacturing processes and products, Forbo drives innovation to ensure their flooring makes positive impacts to the indoor and outdoor environment. An artist that works at the crossroads of data and drawing, Manchester-based artist Daksha Patel’s practice extends to printmaking, animation and installation to visualise what is immeasurable, illusive and unseen. Colour, light and mapping are emerging themes in Patel’s work, which has also been influenced by a series of residencies in scientific environments, including LifeScience at the University of Dundee and The Christie Hospital in Manchester. She often produces work using ‘unstable’ natural materials such as oil or clay. Blackburn Yarn Dyers is a business founded over one hundred years ago in 1915, providing yarn dyeing to clients worldwide from the heart of Lancashire. Working with leading fashion and interiors brands in the UK and internationally, the company offers a range of products and services in support of the textile industry as well as hand-knitting and craft brands, with dyeing and bleaching remaining at the core of its trade. The first completely digital art commission in the three years of Art In Manufacturing, Liz Wilson’s multimedia work encompasses visuals, whether static or moving, as well as explorations into sound. A graduate from the Royal College of Art, her practice explores the relationships between industrialisation, technologies and print. Her most recent exhibitions include Taoxichuan Museum of Art, China and Parc de la Villette, Paris. Having been introduced to The National Festival of Making as exhibitors in the event’s skills tent in 2018, Clitheroe’s Spiroflow – with a US base in North Carolina – rejoins the festival line up by hosting Wilson’s residency. Industry leaders in the field of bulk materials handling, Spiroflow is a manufacturer of equipment such as mechanical conveyors, bulk bag fillers, bulk bag unloaders and other process equipment. 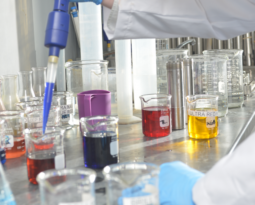 Spiroflow serves a wide range of industries across the globe including food processing, pharmaceutical, chemical and dairy. “Art in Manufacturing provides an incomparable platform for artists to make brand new work in, and alongside, major industry with outstanding results spanning soundscapes to sculptures. 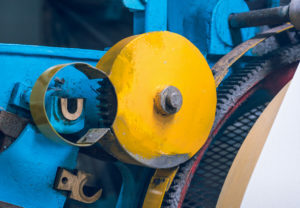 The connectivity and access to industrial making practices, machinery and techniques allows artists to explore making works that would often be impossible in the confines of an artist studio. The previous two years have demonstrated how the human connection in making is a vital component of creating ambitious new work, as artists co-create with factory workforces who share skills, craftsmanship and personal histories, directly informing artistic outcomes. “On industrial estates hidden from view up and down the country there is another world of technological innovation, pioneering engineering and globally-reaching production. 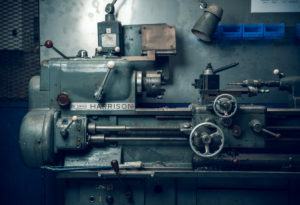 Each manufacturer represents a community of people and connected families both in the present and perhaps the generations that have worked there in the past. For these reasons alone it’s vitally important that artists play a role in telling the stories of manufacturing in new and unexpected ways, something which Art In Manufacturing has done with such thrilling success in previous years. The National Festival of Making, returns to Blackburn, Lancashire for its third year in 2019, with the free-to-attend festival moving to a summer date for the first time. Of the 40,000 people visiting the 2018 festival, 10, 800 took part in over 100 workshop sessions, engaging with makers as diverse as leatherworkers, engineers, ceramicists, chefs, technologists and fashion designers. The immediate impact on the local economy of the two-day event has been estimated at just under £1million in visitor spending over the festival weekend with over half of visitors visiting local restaurants, bars and shops during their visit. With 91% of visitors, 41% of whom were under-21, stating that they had been inspired to explore new making skills, the festival’s long-term aim is to continue raising national and international awareness of the societal and personal benefits of making, moving visitors to consider their own talents, aspirations and making potential. The promise of ‘a new kind of festival for a new age of making’ was made by co-founder, director, and Lancashire-born designer, Wayne Hemingway. The pledge by the Red or Dead founder (which established its manufacturing base in Blackburn in 1983), now leading HemingwayDesign to realise socially-conscious, creative design projects and festivals, has led to a one-of-a-kind, town centre event successfully uniting food and drink, technology, major manufacturing, engineering, art, craft and design. In December 2018, The National Festival of Making won Best Non- Music Festival, in the prestigious UK Festival Awards, recognising the festival’s inclusive atmosphere of discovery and celebration, as well as clinching Visit Lancashire’s Tourism Awards, Large Event of the Year accolade, the festival is set to grow to meet demand. The National Festival of Making and Art in Manufacturing recently announced funding commitments from Arts Council England, which has confirmed grant funding support for the festival for both 2019 and 2020. These projects are made possible by money raised by National Lottery players. Further support is provided by partners Blackburn with Darwen Borough Council and a range of private sponsors. The National Festival of Making CIC is a Community Interest Company set up to curate, produce and deliver a meaningful Festival of Making in Blackburn and Lancashire. The CIC is formed of representatives from Deco Publique and HemingwayDesign. The CIC aims to – Celebrate the industrial heritage and contemporary future of the UK and Lancashire’s making industries; Create a making celebration in the form of a participatory, diverse, inclusive and multi-generational festival experience; Place inventive making experiences at the core of the festival to inspire multi-generational audiences to become industrious future makers; Support Place-making and boost local economies. House of Hemingway has grown to include the multi-disciplinary and award winning HemingwayDesign, HemingwayDigital and Hemingway-directed events, such as The Vintage Festival, Classic Car Boot Sale and The Urban Village Fete. All of this is led by two generations of the Hemingway family and a pool of talented designers. Our work takes us across interiors, landscape planning and housing regeneration, to exhibitions, event planning, products and fashion – and we do it all with a community-focused conscience. Deco Publique is a creative practice based by the sea in Morecambe. Our work is about place and experience – we consider the cultural possibilities across festivals, events and projects in coastal spaces and Northern towns, producing work that resonates with audiences and has a tangible impact on place and location. We work with people creatively and operationally to produce beautiful cultural festivals and projects. Deco Publique are the Lead Curators and Producers for The National Festival of Making. Super Slow Way is an arts programme in Pennine Lancashire shaped by local communities working alongside a wide range of local, national and international artists. The organisation is part of Arts Council England’s Creative People and Places action research initiative, with a remit of increasing participation in the arts in areas of typically low engagement. Super Slow Way works with communities along the Leeds & Liverpool Canal from Blackburn to Pendle, bringing art and artists to a space where time slows down, to look afresh at how people live their fast-paced lives and how they relate to their environment, neighbourhoods and to each other.